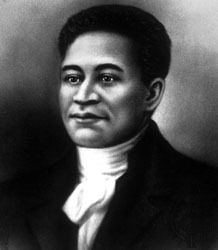 Attucks, an escaped slave, was present in a crowd of protesters in Boston when they were fired on by British troops on 5 March 1770. Four whites -- Samuel Gray, James Caldwell, Samuel Maverick, and Patrick Carr -- and one black, Attucks, were killed in the volleys, now termed the Boston Massacre. Traditionally he is considered the first man killed in the American Revolution, though there is some debate about whether or not this is accurate. Future president John Adams defended the soldiers against murder charges. He described the protesters as "a motley rabble of saucy boys, negroes and molattoes, Irish teagues and outlandish jack tarrs."